Welcome to Issue IV, Volume IX: March 2018 of Connotation Press: An Online Artifact. Two days ago, at the end of one of the warmest Februarys I can remember, and shortly after that freak storm in the video, our first flower of 2018 broke through to daylight on the grounds of Innsfloyd, home of Connotation Press. 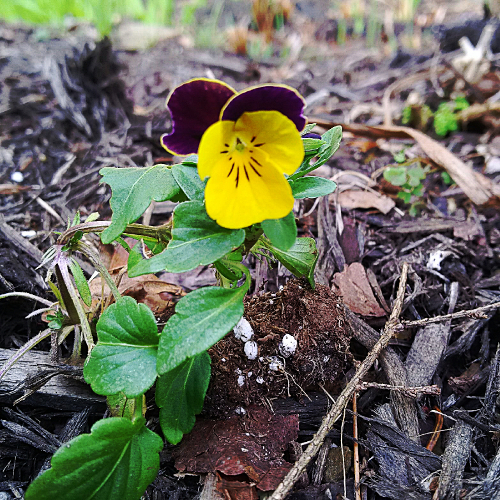 Full of confidence and bravado, this little pansy then another popped up in the garden directly under the flowerbox we were growing them in last year. So much spectacular perfection in such a tiny package. I write these things today because they both gave me cause to smile, and in an attempt not to digress into yet another rant about the disgusting filth and sickness that is the body politic here in the US. This month, I’ll just say how grateful I am for the beauty around us, and get to kickin’ this pig to see what it’ll do. 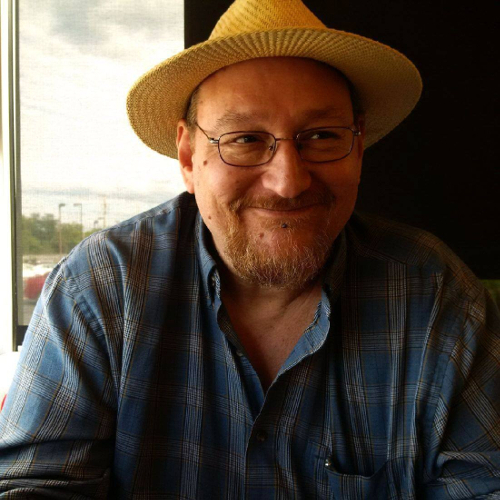 A Poetry Congeries with John Hoppenthaler launches this month in expectation of AWP as John discusses a panel he’ll be on at the conference. From there it is our honor to bring you stunning new work by Alessandra Lynch, Mara Pastor translated by María José Giménez, Allan Peterson, Kimberly Burwick, Geri Doran, Juliana Gray, and John’s featured poet, the amazing Tarfia Faizullah. Thanks to John for another great column, thank you to all the brilliant poets that sent us their work, and safe trip to everyone attending AWP. Meg Tuite’s back this month with her Crazy Rabbit Review. This time she brings us stunning new work by Douglas Wood. In addition to a handful of dark, moving, and especially timely pieces, we also have an interview Meg conducted and a video of Douglas reading his work. I would say the topic of this writing is for a mature audience, but with mass shootings happening with such frequency in this country as to make it difficult to even keep track of all of them, this work is for, sadly, everyone. Thanks Meg & Douglas for strong work on a difficult task. Our music column has been on hold recently as our dear friend Al Maginnes has been in and out of the hospital with issues far more pressing than a magazine deadline. Still, as he has done for years now, somehow he manages to surprise me. This month Al reviews Gregg Allman’s final album, Southern Blood. And I’ve got to say, I enjoyed this review almost as much as the vinyl. Great to have you back, Al. We’ve missed you, pal. Finally, we have two new book reviews this month from editor Julia Bouwsma. First, Sara Borjas reviews Vanessa Angélica Villarreal’s new poetry Beast Meridian. Sara gives it a glowing review, and she writes in her introduction, “Beast Meridian is not just a collection of borderland, Latinx or Chicanx experiences and the stages where whiteness erases them—it is a physical place, a liminal house in which the speaker confronts her life in the eternal hallway of the subconscious. It is part starter home (two-bedroom to be exact), part nepantla, part tenth dimension, part chisme (from all the tías not just that one—you know that one), part history, part open sky.” Our second review this month is for Hunger, the new collection of poems by the brilliant Judy Jordan. Donna Vorreyer, who we love!, also gives high points to Jordan, as well, as she writes, “Jordan deftly uses the eye of a naturalist to bring the reader not only the despair of homelessness, poverty, starvation, and how the world can fail us, but also to give us the hope, rebirth and wonder held in the natural world.” I love both of these reviews and can’t wait to read the books. Great job Julia, Sara, and Donna! That’s it for the first of the month post. As always, I welcome you to return on the 15th for the release of our Poetry, Fiction, Creative Nonfiction, and Wine Review columns. And remember, when the world gets you down, when the stupidity of the idiot-in-chief in the increasingly yellowing white house makes yet another brainless, mean, disgusting comment, there is still a world of freak snowfalls and beautiful, life-affirming, tiny little flowers out there waiting for you, patiently waiting to restart your heart.